Prepare the peanut dipping sauce: place ingredients in a bowl or blender and whisk together until smooth. Depending how thick you like your sauce, add more or less water. Prepare vermicelli according to package instruction. Bring water to a boil, add vermicelli, cook for 3-4 minutes, drain and immediately cool down with cold running water. Drain well. Store leftovers in fridge and use in stir-fry or other recipes, like spring roll bowls. Prepare vegetables - shred the cabbage, julienne the carrot, cucumber and bell pepper. Cut tofu in strips. Assemble the rolls: Prepare rice paper according to package instruction. Dip in warm water for about 10 seconds, then place on a damp kitchen towel. On the bottom half of the paper, place a bit of each: some vermicelli, some vegetables and two tofu slices. Sprinkle with chopped peanuts and spring onion. Take care not to overload your stuffing. Then, wrap the roll: first fold the left and right side of the paper in over the filling, then the bottom side up, press in and roll it out to a nice firm roll. Cut roll in half with a sharp knife and place on a plate with the open side up. Continue until you use up all the rice paper. If any vegetables are left over, store in an air-tight container in the fridge and use up in a salad. Serve spring rolls with the peanut dipping sauce. 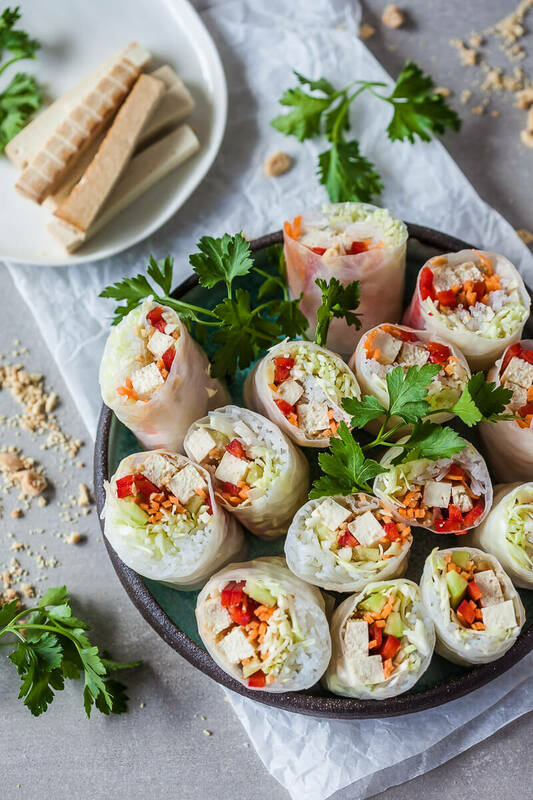 You can store the rolls in an air-tight container in the fridge for a couple of hours, but not too long, as the rice paper will dry out.